I find it really interesting to read the comments in our guest books. It seems that most of the things I love about the Hill Country and our bed & breakfast, are the same things that guest love too. When I read through a journal and they say things like how they love watching the sun come up while sitting on their porch enjoying that first cup of morning coffee. Or how the cats are so fun to watch and cuddle with outside their cottage. Many of them comment on how our grounds are just magical and have so many things to find hidden at each turn of the garden. Then of course, there is the Art Trail, that takes you winding through our 20 acres with fun art and sculptures on the way, or stopping off at the bench to watch the Red Tail hawks circling overhead with their beautiful call to each other. The prayer tree is a peaceful place to stop and reflect on things in their lives, it has been adorned with so many trinkets that have a special meaning to each guest that leaves one there. With October now here, the leaves are changing quickly and starting to fall, which is such a peaceful sound to me. Guest comment about each room they stay in how we have created the perfect atmosphere for a romantic getaway. With the beauty of nature coming right to your door step, but with the comfort of all you need in a guest cottage. We love our beautiful 20 acres, and feel we have been so blessed to do what we do, to greet new guest every week, do wedding ceremonies and make them feel like our total attention is on them. To prepare fresh tasty breakfast and deliver it to their cottage each morning. To see couples sitting by an open fire at night just relaxing. We love the Weekend getaways that we get to create here at Star of Texas B&B, and we hope that if you have not come to stay with us, that you will put us on your list of places to come and stay, and if you haven’t been to see us in a while, please come again. 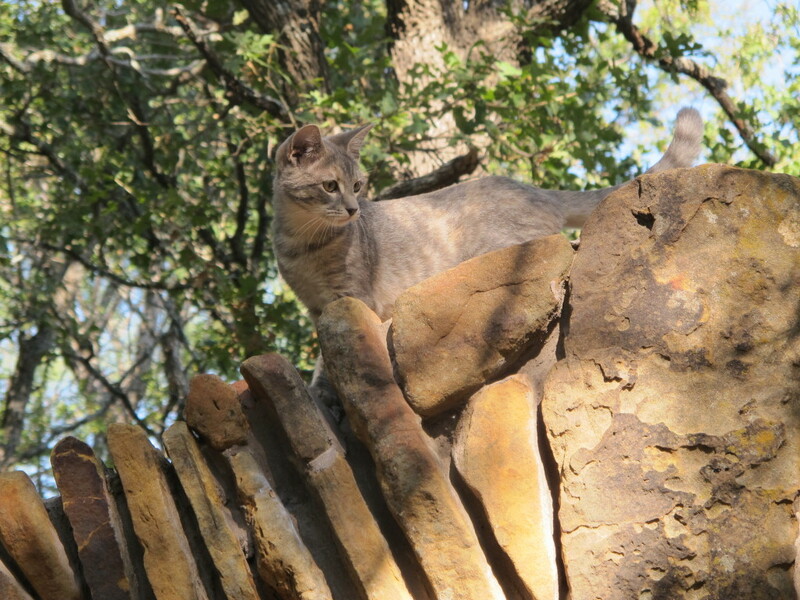 This is Sugar on top of the Rock Moon Gate, one of the new kitties to greet you when you come. This entry was posted in Deb's Doodles, Romantic Texas Getaways and tagged Texas hill country bed & breakfast, weekend getaways by admin. Bookmark the permalink.